We have seen the all new Facebook interface which was introduced last year, most of us liked it but some didn’t, they tried getting the old Facebook interface back. Well, I’m happy with the new interface. The Facebook chat feature is really cool, chatting is much easier than going into different profiles and writing on their walls. The chat is certainly good but sometimes when there are a lot of friends online who want to chat with you when you’re busy then it might turn out to be annoying. 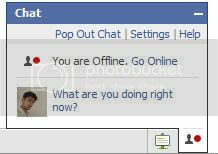 You might have observed that the Facebook chat doesn’t have any option for appearing offline or hiding from your friends. Luckily, there’s a Facebook application known as Online Now. You don’t need to sign in and have a sneak into the online friends list. It allows you to view your online friends while being offline. It generates a new page which displays the list of your online friends. It keeps on refreshing after certain time to keep you updated on the status of your friends. Online Now does not affect your Facebook Chat online status. If you want to appear “invisible”, simply turn off Facebook Chat and use Online Now to see who’s online. But the down point is that you can only chat with your friends if you turn on the Facebook Chat and appear online. But nevertheless it’s certainly a good application. Firstly go to the Online Now application page and add it. Once you’ve added it go to the online now page to have a look at the online friends without even signing into chat.